See New York City like never before on this 28-30 minute helicopter tour. Capture views of iconic Manhattan attractions including the Empire State Building, Rockefeller Center, the Chrysler Building, the World Financial Center, the Statue of Liberty, Ellis Island, and the Brooklyn Bridge, and continue up the Hudson River to the northern point of Manhattan to see even more sights. You'll also enjoy views of Brooklyn and Staten Island. Also fly south over the Verrazano Bridge, the longest suspension bridge in America. 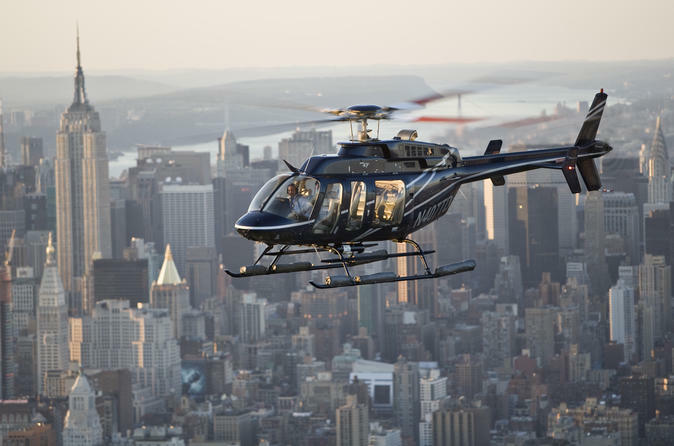 Add a special experience to your New York City vacation with a deluxe 28-30 minute helicopter tour over New York City. Starting from the Downtown Manhattan Heliport, fly over Manhattan's most iconic landmarks including the Empire State Building, Rockefeller Center, the Chrysler Building, and the Freedom Tower. Soar over New York Harbor to see the Statue of Liberty, Ellis Island and the iconic Brooklyn Bridge. Extend your flight up the Hudson River, travelling all the way to the northern point of Manhattan. Behold the man-made miracle of the George Washington Bridge and nature’s miraculous New Jersey Palisades. From above the Hudson, landmarks such as Yankee Stadium (on non-game days), the Cathedral of St. John the Divine, Columbia University and Central Park can be seen. You'll also enjoy views of Brooklyn and Staten Island. Fly south over the Verrazano Bridge, the longest suspension bridge in America.